1) Before knowing the effect of 12th house lord in 6th house we have to know about Twelfth House and Sixth House. As 12th house lord is placed in 7th from own house so you may read First house lord in 7th house. When 12th house lord is placed in 6th house, native has enmity with own person. Native is angry, sinful and suffering from sorrows. Native will has inclination to establish relationships with others wife’s. If 6th house lord is natural malefic then native will be cheap. He may be suffering from eye related issues. He may be getting death via elephant. If 12th house lord is venus then native may be suffering from eye sight related issues. 3) 12th house is a trik house and 6th house is also a trik house so when 12th house lord placed in 6th house then it may cause obstacles for 6th house significant and makes a Viparit Rajyog. It’s simple meaning is 12th and 6th both house belong to obstacles in native’s life in general way. 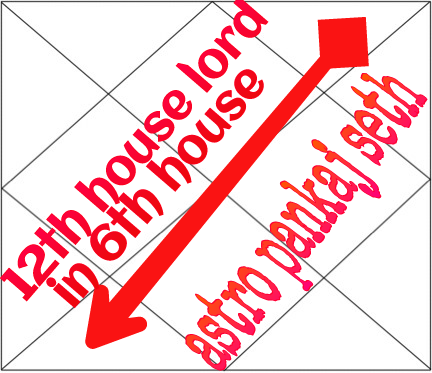 So when 12th house lord placed in 6th house, it may cause obstacles for producing 6th house natural effects. It is name as Viparit Rajyog more powerful obstacles means more powerful yog so it is consider malefic producing powerful Viparit Rajyog. 4)6th house belong to disease and 12th house belong to expenses so 12th house lord in 6th house is indicating expenses of disease itself. My means native may has well health (until 6th house and 12th house is not afflicted by any other planet). Or it is indicating loss of disease. Native may be belong to hospital or medical line. Native may be looking handsome. 5) 6th house belong to enemy so when 12th house lord in 6th house it may cause native may gets victory over his enemy because 12th house lord in 6th house make enemy weak. But this doesn’t means native may has not any enemy. Native may has many enemy but native has capable to crushing his enemy. So 12th house lord in 6th may cause mental stress. 6) 12th house lord in 6th house is indicating native may be expense his debate power. My means native may be angry quickly and starting quarrel because native have tendency to expenses his fighting capacity. Native may be lawyer or working in any legal field. 7)12th house lord in 6th house may cause native may be involving in immoral acts. Native may be suffering from blaming or litigation. If it is badly affiliated by any melific then it may cause jails, legal problems, loss of his name and fame. Native may be very experts in frauds or cheating and he will be excess cleaver. 8) When 12th house lord is with 6th house lord then its making a strong Viparit Rajyog. So native may be wealthy and enjoying all materialistic happiness. Native may be fortunate regarding all his works. Native may gets name and fame and enjoying a good health. If afflicted then it may cause loss of reputation and suffering from litigation. 9)If you want to know about effect of different planet in 6th house you may read this.